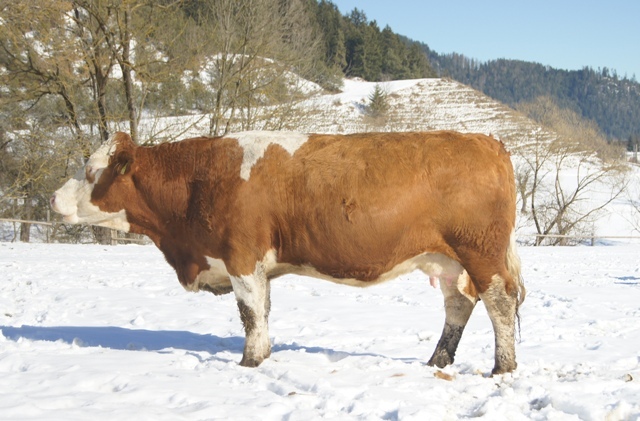 2015 is gonna be a tough year for the Austrian beef cattle breeders and suckler cow farmers. It will be the first year since the mid 80ies without the suckler cow premium. Especially in Austria, where lots of suckler cows are kept in mountain regions, the premium was importand for the farmers. Well, whereas other countries, like France, decided to continue paying the suckler cow premium, Austrian agrarian policy decided against any coupled premiums. The impact of this decision isn’t known yet. As mentioned lot of farms are in the mountain regions and are organic farms. Lots of them sell there calves after weaning. There is one program for organic suckler cow farms called „Bio Jungrind“. Both the castrated male and female calves are slaughterd after weaning between the age from 8 to 10 months (age maximum is 12 months; carcass weight should be about 230 kg, the minimum is 190 kg, classification E,U, R; fat class 2 and 3). The current price is 4,60 € (carcass weight) – so with high quality calves farmers can earn 1.000 to 1.200 € per calf. It’s almost necessary to feed the calves with concentrated feed to gain good results. Other farmers sell their calves after weaning for fattening (so from the grass land areas in the mountains to areas with more arable farming). The price per kg for those calves is usually lower than the price for the organic “ Bio Jungrind“ calves. Other suckler cow farmers (especially in regions with higher harvest and cultivation), who until now sold the weanlings, are planning to keep them and fatten them on their farm. But that’s not possible for all the farmers, in some areas it would be neccesary to buy the corn, in other cases a building alteration is necessary. There is a „quality premium“ for cattle in planning (for vealers, weanlings of suckler cows, steers, bullocks, heifers). The details are yet unknown, but it’s a program where extra costs are covered (e.g. membership fees) and it won’t cover the loss of the suckler cow premium. Not all suckler cow farmers are looking for ways to compensate the loss of the premium by increasing the income with the suckler cows. Some are thinking of changing to fatting bullocks or heifers (again there a special programs in different regions), or switch to other animal species (e.g. sheeps), or they consider stopping farming all together. This is just a quick overview of the current situation of the Austrian suckler cow farmers and beef cattle breeders. We don’t know what exactly will happen in the next years. Too many factors are still unknown, but it’s certain that it’s gonna be a tough time.